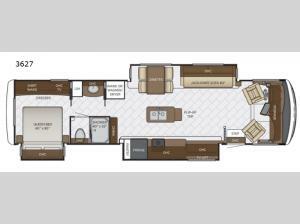 You will be impressed with the kitchen on this 3627 Canyon Star motor home! The island has a flip-up counter plus a double sink which makes cleaning up a breeze. Enjoy your meals, a card game, or another cup of coffee at the free-standing table. As you head toward the rear you will come to a walk-through bathroom which leads to the rear bedroom. Throughout this model there is plenty of storage space with all of the overhead cabinets!